We’d all love to have a kitchen that is perfectly organized and uncluttered, with only the utensils, cookware and utensils that are absolutely necessary. At least – we always think we’d all love that. When it actually comes time to get cooking, we’ve found we really love having a fully stocked kitchen with a tool for virtually every task we can think of – from a lemon squeezer to a milk frother for homemade latte. We could certainly free up some room by ditching all those unitasking tools and opting only for versatile multitaskers – but do we really want to? Not really. 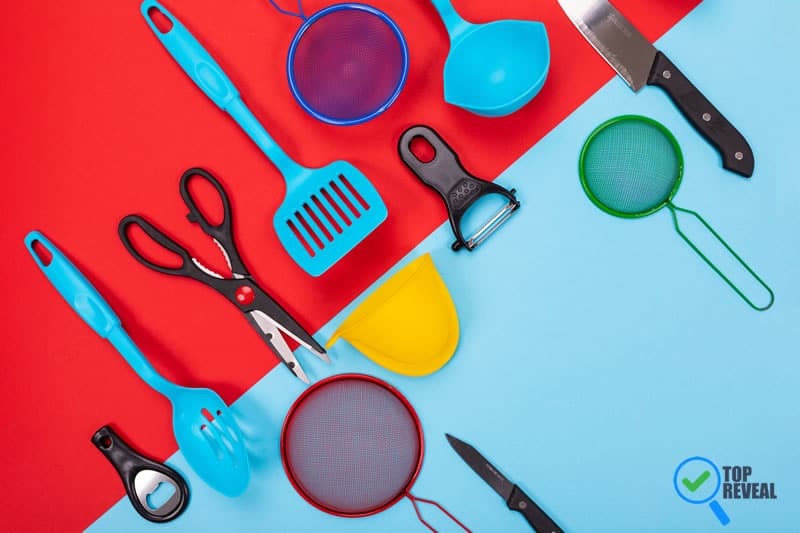 We’ve found there are some kitchen tools you simply can’t (or shouldn’t) live without. Here are 6 of them. Garlic presses generally have a reputation as a very specific tool without many alternative uses, but as it turns out, this is a versatile tool. Fresh-pressed garlic that has been pressed in a proper garlic presser is that much sharper and snappier, in a way that smashing your garlic can’t quite replicate. It’s also a lot faster. You can also use it for ricing egg yolks or mincing all sorts of other things – like ginger. Yeah – they’re hard to clean, but we always keep one around. Cooking without it just wouldn’t be the same. Like a garlic press, a lemon press seems to have a very limited purpose – but with some creativity, it becomes an essential part of any kitchen. Fresh pressed lemon juice beats bottled juice anytime, and you can use it for almost any fruit – grapefruit, limes, oranges. Be sure to get the handheld squeeze-press kind – not the kind where you have to hand wring the lemon on a rounded spike until all the juice has come out. A handheld lemon squeezer is so much easier – and fun – to use. You’ll get more juice for much less effort. And it’s easy to use – and a ton of un. Bonus points: You’ll get less citrus juice on your hands, which can really sting when you get it in a cut. Spiralizers are another one of those things you don’t think you need, but then one day you use one and realize you’ve been missing out all this time. They’re an easy (and fun) way to get a lot more vegetables in your meals, as you can easily spiralize some zucchini, carrots or pretty much anything else you want (sweet potatoes, apples, eggplant, and more) with just about zero effort. And don’t worry – a spiralizer doesn’t take up a whole lot of room in the kitchen. There’s no real reason not to get one – unless you just really hate veggies. Every chef needs to know how to make a good omelette, and that means being equipped with a capable, reliable omelette pan: one that is wide and flat, with gently sloped edges that make flipping the omelette and sliding it out when it’s done easy. It should also be made of a quality, sturdy material that conducts heat well in order to create that perfectly-browned, thoroughly-cooked omelette you’re after. Over at Cookware Junkies, they recommend done made of aluminum, with a quality ceramic non-stick coating that won’t peel, chip or flake. Trust us on this one: get the right omelette pan and you’ll never look back. And don’t forget – you can use a good omelette pan for anything you’d use a regular skillet for. Many people overlook immersion blenders and opt to just user their everyday blender or a large mixer – but we’re here to tell you: they’re making a mistake. When you just have to mix a small batch of something – a batch so small that putting in a blender just seems like a waste of effort and extra washing – you need to reach for an immersion blender. Everything from quick smoothies to pastes, sauces, and gravies becomes that much easier, and you can easily make a single batch right in the high-sided container (think mason jar) you’re planning to store it in. If you didn’t know that “microplane” was a thing, you could be forgiven. This handy little tool is usually seen as nothing other than a small, handheld cheese grater or sometimes as a “zester” – for grinding up lemon zest. But it’s even more than that. Turns out “Microplane” is a brand (kind of like Velcro or Kleenex). Names aside, why do you need one? You could use a regular old box grater to grind up your lemons, sure . . .but that can lead to some awkward grinding and maybe even cut-up knuckles. Microplanes make it so much easier to grind up small pieces of cheese, lemon and lime zest, etc. Also, if you want to melt cheese into a sauce, being able to “micro” grind it is a lot easier than grinding it into larger shreds, as a large box grinder might. 24 Decadent Low Carb Dessert Recipes-You Won't Miss What's Missing!